Ten years ago, on a blistering summer day in New Haven, Italian immigrant Enza Madalloni sat behind the wheel of “Betsy,” her green truck. In the bed of her truck was the bow of a 15-foot boat. Crowded around the stern and sides were more than a dozen sweaty but determined community gardeners. The makeshift nautical raised bed sailed along the streets of a city where accessing healthy food can be as tough as finding water in a desert. With Enza at the helm, the boat drifted though the Fair Haven neighborhood, an area with no grocery stores and limited greenspace. When volunteers anchored their vessel in the budding community garden on Castle Street, they celebrated by shoveling in soil and compost and planting corn, beans, and squash. It was on Castle Street, and in many other community gardens around New Haven, that Enza shared her garden know-how with diverse residents. “Every garden is unique,” she says, her voice and body weakened by cancer, but her memory still strong. She ought to know; she worked for the New Haven Land Trust managing community gardens for nearly seven years. Many of the Land Trust’s six hundred or so gardeners are immigrants, like Enza, who enjoy cultivating fruits, vegetables, flowers, and herbs that supplement their diets and provide a vital connection to their homeland. 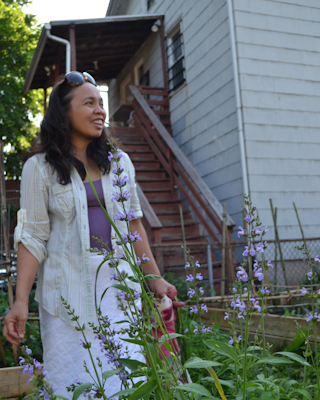 Like many of New Haven’s community garden champions, Enza is a skilled cultivator and gifted storyteller. She has risen to legendary status as New Haven’s best gardener, even among those who have never met her. Although she retired from the Land Trust four years ago, grape vines and fava beans that she smuggled over from Italy can still be found in plots around New Haven. After hearing many incredible stories about this petite and spirited Italian woman with fabled Herculean strength, I was dying to meet her. In June, I hit the fava bean jackpot. Enza invited me into her home, just blocks from Castle Street. She sunk into her living room recliner, which doubles as a retirement throne, and began to share the stories of New Haven’s numerous and diverse community gardens. Enza was one of several gardeners who graciously contributed to this collection of stories about New Haven’s community gardens. They work in urban greenspaces nestled in the backyards, schoolyards, vacant lots, senior citizen centers, and public housing developments that span the city. Just as biological diversity builds a healthier environment, a mixture of backgrounds, ages, and abilities is what makes the gardens thrive. Fruitful greenspaces supplement diets for those of low socioeconomic means. Gardens make fresh fruits and vegetables possible in an otherwise barren food desert, where grocery stores are hard to come by and their food is out of economic reach for many residents. Above all, they build community by transferring knowledge across age, race, class, and culture in a notoriously segregated city. Yet as strong as the gardens become, fueled by the will to transform urban blight and sustained by the resolve to sow each spring, they are at the mercy of shrinking budgets, the whims of City Hall, and the bulldozers of development. As I found out during my conversations with Enza and other community gardeners in New Haven, every day is a fight to keep the gardens intact. These are the stories of people set on cultivating healthy food and healthy communities – work that is difficult to translate into dollar signs, but is more valuable than property tax revenues. These are the stories of folk who contend that lasting human relationships and meaningful connections to healthy food cannot be bought. These are the stories of New Haven’s community gardeners. Every September, Yale opens its doors to a flood of incoming students, many of whom feel safe only when those doors swiftly close behind them. They hear through the grapevine—no relation to Enza’s grapevine—that New Haven is a dangerous place. When I came to New Haven a year ago, I found myself perplexed by this attitude. The ironclad gates and spike-topped fences created a physical barrier between classrooms and communities that had so much to offer one another. I craved a sense of belonging in this city, a city in which myself and 11,000 other students lived, but few called home. Then, a fortunate thing happened. I met Chris Randall. Chris is the Executive Director of the New Haven Land Trust. He oversees the stewardship of six nature preserves and fifty community gardens, in addition to serving as Democratic Chair of New Haven’s 8th Ward, and as a result, he knows everyone. After a mutual friend introduced us, Chris connected me to gardeners, community leaders, and even to my next-door neighbor. Despite his serious responsibilities, Chris is playful by nature. He wears many hats—of the costume variety, that is. At this year’s Polar Plunge for Parks, a charitable benefit for the Land Trust, Chris was dressed as Poseidon, god of the sea—complete with trident, bushy blue beard, and flowing toga. And when he’s not making appearances in a suit and tie, he might be romping around farmer’s markets in an eggplant costume. His neighbors may have agreed. One summer day in 1998 Chris was blasting profane rap music from his open window. This provoked a 2-page handwritten letter asking Chris to stop subjecting the neighborhood to obscenities. Two weeks later another handwritten letter arrived, this time inviting Chris to join the groundbreaking of a new community garden. He seized upon the opportunity to get involved and “prove that I’m not always a jerk,” Chris said. Though he had no prior gardening experience, he became active in the effort to reclaim a blighted lot on William Street. Two years later, the majority of the garden’s founders moved out of the neighborhood, leaving Chris as the lone gardening ranger on William Street. “I didn’t know what to do,” he said. Not wanting to see the garden return to its former state, Chris began recruiting people and organizing workdays. Through trial and error, he quickly acquired gardening knowledge – cultivating vegetables and a sense of community along the way. “It turns out I was pretty good at running a community garden,” Chris said. As the garden flourished in the community, so did Chris. “The William Street community garden changed my life,” Chris said. Through his work in the garden, Chris found belonging in his neighborhood and discovered his capacity to generate positive change. Eleven years later, Chris Randall was hired as the Executive Director of the New Haven Land Trust. Once called a “hazard to humanity,” Chris is now lauded by current Connecticut governor Dan Malloy as “the bravest man in New Haven.” Despite his powerful positions, though, I get the sense that Chris feels most comfortable sweating side by side with community members among the squash and collard greens. “I can walk into any neighborhood in New Haven,” said Chris, “and reach out to or relate to anybody there, because the garden is there.”He seemed to think that I could as well. The next day, we paid a visit to Enza Madalloni, whose reputation preceded her. In Enza Madalloni’s backyard, miles of grapevine weave in and out of a trellis-covered patio, lichen-covered stone cherubs and saints wait patiently, and a tangled mass of wildflowers and grasses threatens to engulf the once well-worn paths through them. It’s the least of Enza’s concerns, though. She’s ill with terminal cancer—her prognosis gives her only until the end of the summer. Her head is wrapped in a beautiful patterned scarf to hide the most visible effect of cancer treatment. Inside Enza’s home porcelain bibles and crosses adorn her shelves, coffee table, and walls – suggesting that faith plays a central role in Enza’s life. Life danced to the tune of nature’s rhythms: the seasons, plant cycles, the rise and fall of the sun each day, the phases of the moon. “You start your seeds on the first full moon in January,” Enza says, recalling knowledge that her parents and grandparents sent with her to America in 1971 after an arranged marriage. Upon arriving in New Haven, Enza began to garden in her backyard—the same cherub-studded, chain link-enclosed backyard I see today. But the small plot couldn’t contain her passion. She started to work in a community garden on Blatchley Avenue, and was quickly volunteering in gardens all over New Haven. Before long, Enza was hired by the New Haven Land Trust. She shared her knowledge with people young and old, black and white, native and foreign born, those with yards and those without homes, the able-bodied and those with disabilities. But, Enza says, “The kids was the best part.” She remembers how they would visit her home to help her mix, knead, stretch, and cook pizza dough. The pizzas would be layered with toppings from their “pizza garden,” a pie-shaped plot with “slices” of vegetables and herbs. Through Enza, New Haven’s children learned the origins of food and the pleasures of eating something they had grown themselves. Enza opens up as she describes her relationship with the soil, and her voice softens as she reflects on garden and kitchen memories permeated with children. But this is not the woman I’ve heard so much about. What of the Enza with Herculean strength? Enza’s day sometimes stretched until 10 pm, working under utility lights and tapping fire hydrants for much needed water. “That’s all we had,” she says. The Land Trust lacked money, compost, tools, and water, but was flush with volunteers. In the words of food justice advocate Karen Washington, a “hand in” is more valuable than a “hand out” when it comes to community gardens. In New Haven, those hands come from an array of backgrounds. The city is more than a melting pot, though; New Haveners are a hearty stew simmering in a stockpot, identities still intact but influenced by other flavors, languages, and ways of life. “The more people you get in the garden, the more they learn from each other,” Enza says. Enza’s grape vines can still be found sprinkled throughout the City, she says. I picture trellises like the one in her backyard, living on long after cancer takes her from this world. She will leave more than fava beans and grapes behind; instead, she’ll leave a lasting legacy of cultural exchange and knowledge sharing across age, race, class, and culture. In some ways, Enza has been the spoon that stirs the pot. Ida welcomed Chris and I into her apartment. “This is my castle,” she jokes. Up until a few months ago, residents of Prescott Bush were stranded in a food desert—nearly three miles from the nearest full service supermarket and without adequate or affordable transportation to get there. Many New Haven residents find themselves in a similar situation. Ida’s estimate is conservative, as prices in New Haven’s supermarkets are reported to be 6 to 21% higher than that of their suburban counterparts. On my last trip to a New Haven grocery store, I perused tomatoes from the vine at $2.99 per pound. $4.29 for organic! Even with the extra markup, there’s no telling how long the Stop and Shop will remain in business. Grocery chains have played a “musical chairs” of sorts, drifting in and out of the space, lured in by tax incentives and then forced out by dwindling profits. New Haven’s lack of full service supermarkets is not an isolated problem. The urban supermarket is quickly becoming a thing of the past nationwide. It’s not financially feasible for a supermarket chain to open a store in an urban setting, where low-income populations can’t afford the higher end foodstuffs that keep stores afloat. Actually, Ida has the potential to save quite a bit of money. $187 dollars each year on tomatoes alone, by my estimates. $268 if we’re talking organic, which Ida’s tomatoes happen to be. Collard greens, peppers, and herbs save her more. But, Ida says, stretching her fixed income is secondary to the benefit of meeting new people and drawing on their deep seated knowledge. “Although some of them might have Yale degrees and all that kind of stuff,” she says, “Most of these folk are down home folk that knew what it was, maybe to be a sharecropper. Don’t fool yourself!” New Haven is home to many southern transplants, for whom community gardens serve as a link to the past. As a self-proclaimed “city girl,” Ida readily admits to hijacking some help from her former sharecropper neighbors. If you believe that gardening is for retired folk, then you haven’t met Bill Richo. I’m following him over to the Carmel Street Community Garden in my Toyota Prius; twenty-nine-year-old Bill Richo is sitting behind his girlfriend on the back of a Honda Shadow motorcycle. Jen is wearing tall leather boots and a shiny black helmet with big brunette curls underneath. Bill is tall and gangly, with short hair shaved into a modest mohawk. For Bill, “It all started with food.” As a kid, he says, “you just sort of eat whatever’s on the plate in front of you.” But during his teenage years, Bill started to wonder. What exactly was he was eating? Where did it come from? How it was made? As he learned about the distance (physical and otherwise) between a McDonald’s happy meal and Old MacDonald’s farm, he began to eat less meat and more fresh and organic foods. Listen to Bill Richo’s story. Then he decided to take it a step further. “What else can you do if you really want to learn about your food? You grow it,” he says. But after a failed attempt in a small shady yard, Bill had almost given up. Then one day, he rode his bike past one of the New Haven Land Trust’s 50 community gardens, something he had done hundreds of times. This time, though, he stopped. A sign in the garden listed the phone number for the New Haven Land Trust, and Bill dialed the number. It ultimately led him to Chris Randall, who encouraged him to check out Carmel Street. He rode his bike down Carmel Street for the first time in March of 2010 and found a neglected city block. The street was in desperate need of re-pavement and the sidewalks were a wreck. The garden itself was an overgrown jungle of unidentifiable plants, and it was almost impossible to distinguish between weed and intentional crop. To top it all off, a dead cat lay among the tangled mass of plant matter. But first impressions can be deceiving. “It turns out that it’s a great block actually,” he says. “There are a ton of families, a ton of great, solid people on that block.” What the neighborhood needed was an organizer, and Bill fit the bill. He recruited help from friends and neighbors to clean up the lot. He soaked up every ounce of gardening knowledge he could find, poring over books and picking the brains of experienced gardeners he met. With a little neighborhood muscle, Bill and crew rebuilt the garden from the ground up. Since Bill began his work, Carmel Street has been paved and the sidewalks have been redone. He doesn’t credit the garden with sparking the repairs, but I like to think that positive change is contagious. The garden is still a work in progress, but Carmel Street residents don’t seem to mind the slow pace. “They really appreciate the garden,” Bill says. As I stand surrounded by a handful of gardeners tending a bounty of vegetables, I see much to appreciate. This luscious greenspace brings vibrancy to this once forgotten neighborhood. The Dunkin’ Donuts and KFC that loom at the end of the block certainly get more traffic than the garden, but they don’t provide peaceful outdoor space or free food to neighbors. In the course of one season, Bill went from greenhorn to garden coordinator. Now, he is Regional Garden Coordinator, responsible for supporting eight gardens in New Haven. Maybe positive change is contagious after all. I meet Threese in the William Street Community Garden, where she blissfully sprays raised beds with a garden hose while her four year-old son, John Carlos, furiously pedals along dirt paths on his shiny red tricycle. Ten years ago, the lot was in ruins, but now it is both a playground for children like John Carlos and a reminder of home for Threese, a Filipina immigrant. “I grew up in the city, but we usually spent our summers in the province,” Threese says, referring to Cebu City and Cebu Province in the South Central region of the Philippines. Her mother was raised in the “vegetable basket of the province,” on a farm that grew lettuce, beans, sweet potatoes, bananas, melons, squash, and “Sunkist,” the local name for oranges. Upon immigrating to the United States, Threese realized that “Sunkist” was a brand name. American consumer culture had imbedded itself in Filipino daily life, and imported industrial agriculture techniques were beginning to influence farming practices as well. A childhood spent among the “Asian spinach and tomatoes,” influenced Threese’s desire to grow food and help rural Filipino farmers. A professor of political science at a local college, she also began to notice a disconnect between the theory and the practical work necessary to create change. She “felt so empty,” and decided that in order to understand the policy changes that would truly improve the lives of rural farmers, she would need to walk in the farmers’ shoes. Soon after, Threese met her future husband at a conference and followed him to the US. Here, she felt uprooted. She became depressed and isolated, cut off from family and friends. She began seeing a therapist who tasked her with rebuilding her life and reconnecting with people. Now, she is sharing her passion for gardening with her son John Carlos. While John Carlos may never experience what it means to be a rural Filipino farmer, he will learn to appreciate the value of food on a city block in New Haven. He’ll also get the chance to taste Thai gourd, or “poor man’s beef,” a Filipino food that his mother ate as a child. She happened to find a packet of seeds at a nearby Home Depot. As Threese reconnects to her homeland through New Haven’s soil, she’s simultaneously forging a new identity as a Filipina-American, and connecting with her community. “The community garden gives me the opportunity to interact with the neighbors, she says, “The interaction is so important.” Threese is now far from isolated; in fact, she might go as far as to call New Haven her new home. These days when Chris meets New Haven newcomers, he often suggests a bicycle tour of the community gardens. He might even volunteer his services as tour guide, or as chauffeur in the New Haven Land Trust’s red truck. Accompanied by Chris to the West Rock neighborhood of New Haven, these newcomers might find the Springside Garden, where residents of Liberty Safe Haven, a supportive housing community for the homeless, volunteer their time among the flowers, corn, herbs, and melons. Around the corner from the KFC in Beaver Hills, they might stumble upon the Carmel Street Garden where the smell of deep fried chicken mingles with the aroma of fresh dill and rosemary. On Mead Street, Chris and company can explore the Grandparents Garden, equipped with extra high beds to serve elderly folk with disabilities, who pass on gardening knowledge to their grandchildren. If it happens to be a school day, they can look across the street to catch a glimpse of students at the Barnard Environmental Magnet School gardening in their outdoor classroom. In the Hill section of town, one of New Haven’s poorest neighborhoods, they might discover a bounty of gardeners conversing in Spanish at the Casa Otonal Garden. Chris might then steer the newcomers over to the Public Library in Fair Haven, home to the ABC Children’s Garden, where literacy and healthy eating go hand in hand. The community gardens sprinkled throughout New Haven are fresh oases in a desert of processed and packaged staleness. In outdoor refuges, children learn that cucumbers do indeed originate from the soil, elderly find security in the surplus of a neighbor’s plot, and immigrants retain their culture while finding belonging in a new locale. Gardens provide services that the public and private sectors have failed to adequately deliver—services that must instead be cultivated from the ground up. Together, the individual stories of New Haven’s gardens and gardeners build a mosaic of collective will—will to connect, will to grow, and will to overcome. Each story is unique, but all are spoken in the same language: that of food, culture, and belonging. Although community gardens face an onslaught of threats, Chris, Enza, Ida, Bill, and Threese, those who came before them, and those that will undoubtedly follow, are up to the challenge—both hands in. Amy K Coplen is a Master of Environmental Management candidate at Yale F&ES and will soon be headed for the left coast to conquer a Ph.D in Urban Studies at Portland State University as part of their Ecosystem Services for Urbanizing Regions program. She is enamored with storytelling, radio, food, and community gardens. Her heroes are Ira Glass, Will Allen, Alice Waters, and Lily, a Sesame Street Muppet who promotes hunger awareness. works for the MN office. Thanks! 612-378-2448 Ann M. P.